This morning, as I was walking into work I started seeing spots. Don't panic. I was physically fine, but my style ego was not so lucky. I noticed I was carrying my iPhone in it's cute leopard case. 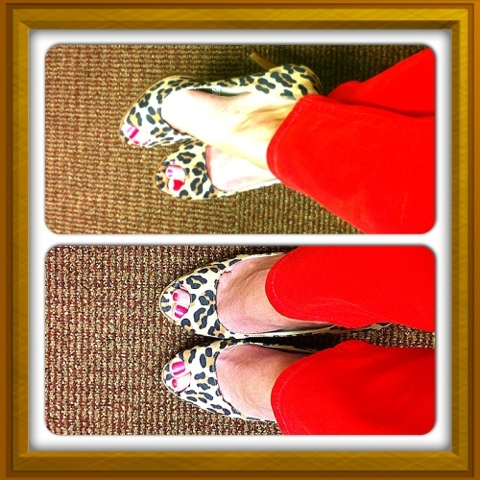 I noticed I was walking in my adorbs leopard heels. I was also sporting my chic leopard umbrella. Fashion faux pas. Seriously, WHEN DID I GET THIS MUCH LEOPARD? If the Fashion Police had been around I would have definitely been arrested. Not pictured are my phone (hard to take a picture of your phone with your phone) and my umbrella (left at my building's entrance), so you don't get the full effect. But, TRUST ME, I looked like a loon! Notice my red jeans?? Stayed tuned for a post about them!